You’re basically wasting your recycling effort by doing this. It’s OK though if you put your recyclables in an open paper bag. The recyclables will tumble out of the bag by the time they get to the recycling facility in order to be sorted correctly and recycled. 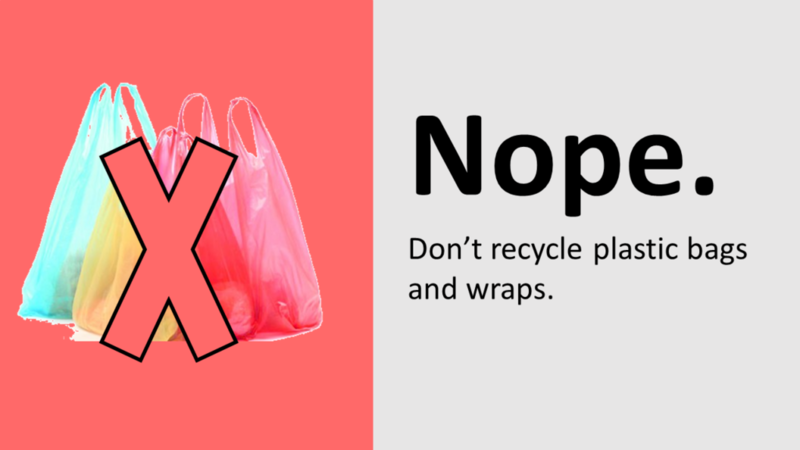 Plastic bags and some plastic wraps are recyclable — just not in your curbside bin! But the vast, vast majority of people need to recycle these items through Store Drop Off. Meaning, recycle those items at your local grocery store along with plastic shopping bags. When you place these items in the curbside bin, they get wrapped on the equipment at the recycling facility, and workers have to stop the machines to climb on them to cut out the bags. And then they get landfilled. 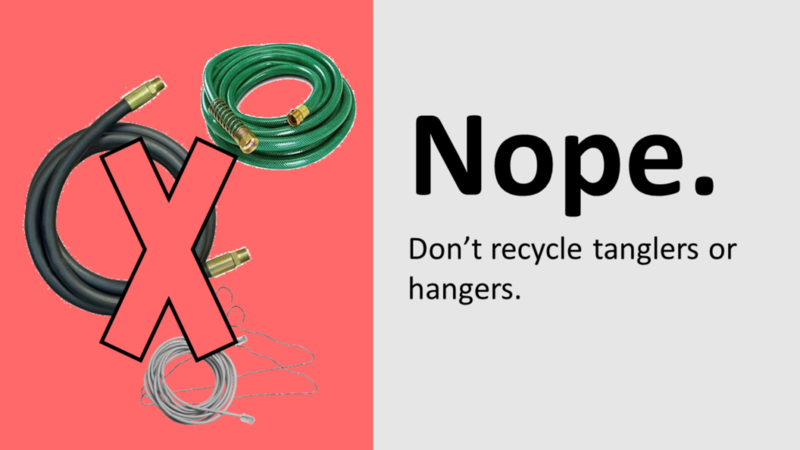 If it’s durable and stringy and you can get it in a knot, then don’t recycle it. These in the recycling industry are called “tanglers” and are looked upon with a special sort of disdain. Examples include electric cords, headphones, garden hoses, chains, wires, hangers, and Christmas lights. Please do not put these in your recycling bin. They snag the equipment so the workers have to shut down operations and go cut them out of the machines. Fortunately, Best Buy and Staples have recycling programs that accept electronics cables and connectors. 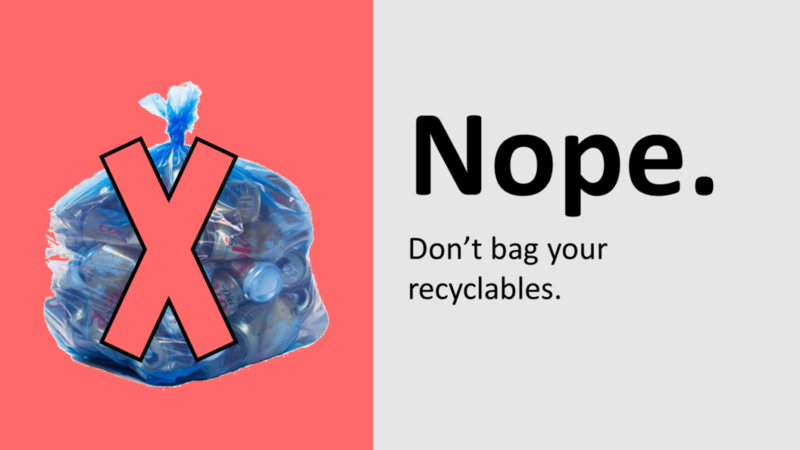 You should not recycle packaging that contains dangerous products — or in other words, products that are ignitable, corrosive, or toxic. Examples include oil paint, motor oil, fuel, poisons, or medical waste. If these items are empty, and all you have left is the packaging, then throw the packaging in the trash. 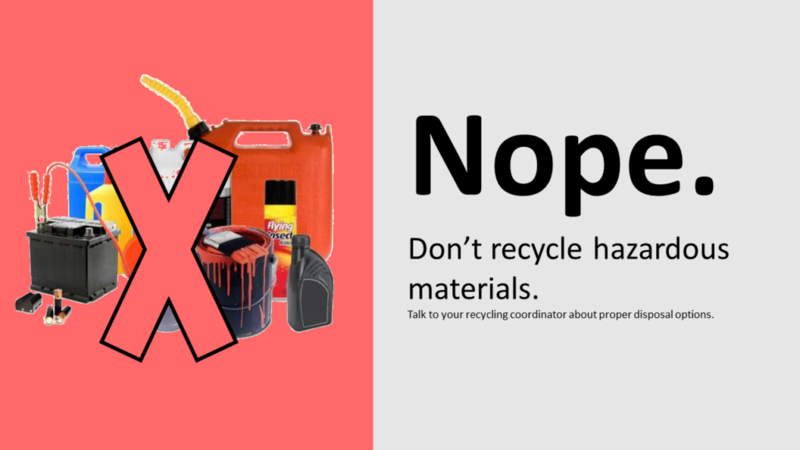 If you still have some leftover product inside the packaging, for example if it’s half empty , then check to see if your community has a way for you to recycle household hazardous waste. Batteries are not curbside recyclable; if you try to recycle them this way, they will get landfilled, but also potentially put others in danger. The corrosive nature of their ingredients makes batteries a hazardous item for recycling facilities. Rechargeable, or lithium ion batteries are of particular concern, causing very dangerous fires in some instances — keep them out of your recycling bin, and your trash bin where they also present fire risks. You have to find a special drop off location in order to recycle batteries. Check out Call2Recycle to find a place near you that can help you recycle your batteries. 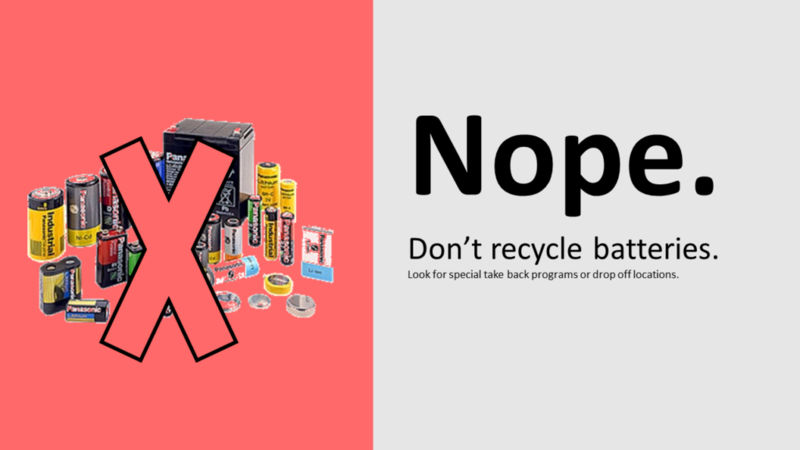 Or, dispose of the batteries at a local household hazardous waste collection point. More people put their dirty baby diapers in the recycling than you’d believe. This is a terrible, terrible idea and wreaks havoc at recycling facilities. If you worked at a recycling facility, would you want those coming into your building, smooshing up against your precious cardboard boxes? Put those diapers in the trash! 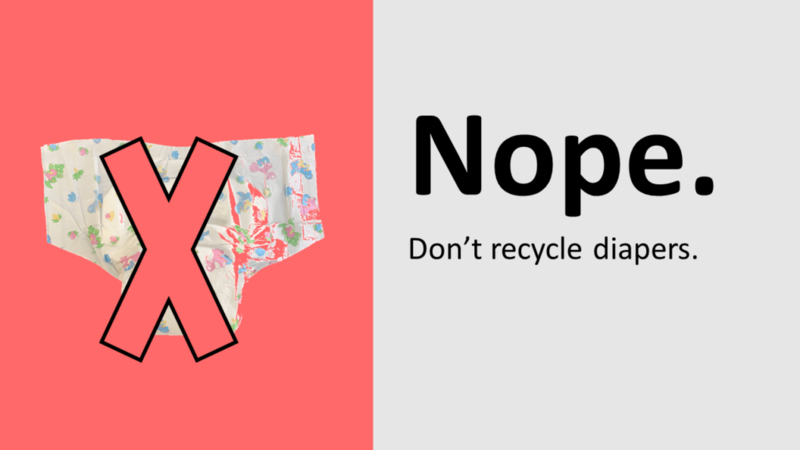 Clean baby diapers are not recyclable either — they’re made of multiple woven materials. If you have a TV, computer, phone, keyboard, smoke detector, hair dryers, vaccuum cleaners, anything electronic--never place that item in your curbside recycling. Instead, you should donate it if it still works. If you want to recycle it, click here to find a special drop off location for recycling with Consumer Technology Association’s Green Gadgets directory. Electronics are a separate recycling stream because they contain highly specialized materials and elements. 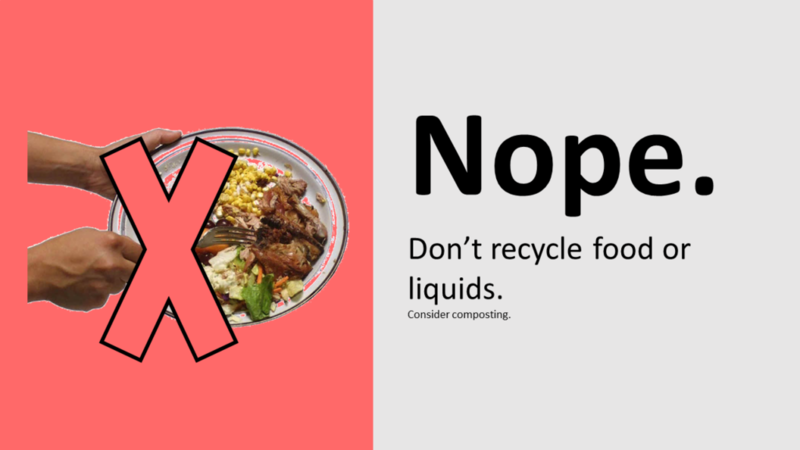 The best way to dispose of food waste is by composting it — either in your backyard, or through a community composting program that may be available to you. But you should never put food into the recycling bin. What I don’t mean by this is, never put any food residue in there — not all the packaging you recycle is going to be, or should be, perfectly clean all the time (because we need to save water, too). But please do not put any big food hunks, or gross, greasy, or otherwise dirty stuff into your recycling bin. The cleaner the recycling stream is, the less contamination there is for the recyclers to deal with. That means better health for the recycling stream. A good rule of thumb: ”no yuck!" 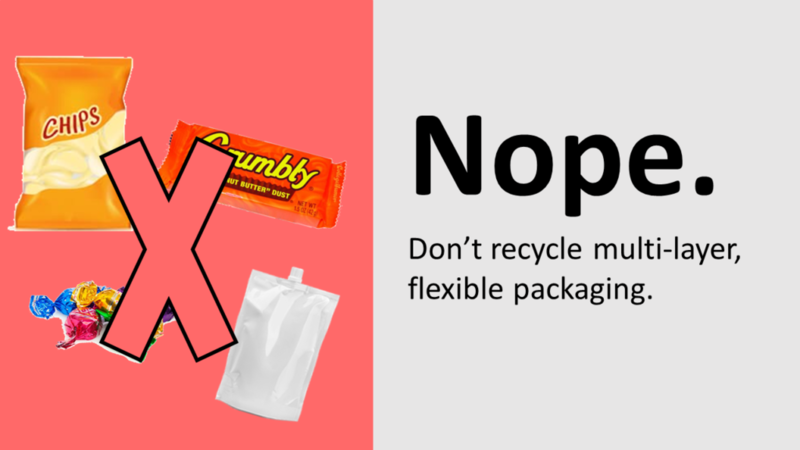 It does come by surprise to many people that most packaging that’s flexible — meaning, you can ball it up — is not recyclable. There ARE some wraps and bags that you can recycle via Store Drop Off. But, the vast majority of pouches, crinkly bags, and other flexible packaging like candy or granola bar wrappers, or baby food pouches, should go into the trash because they are made of many layers of different materials. 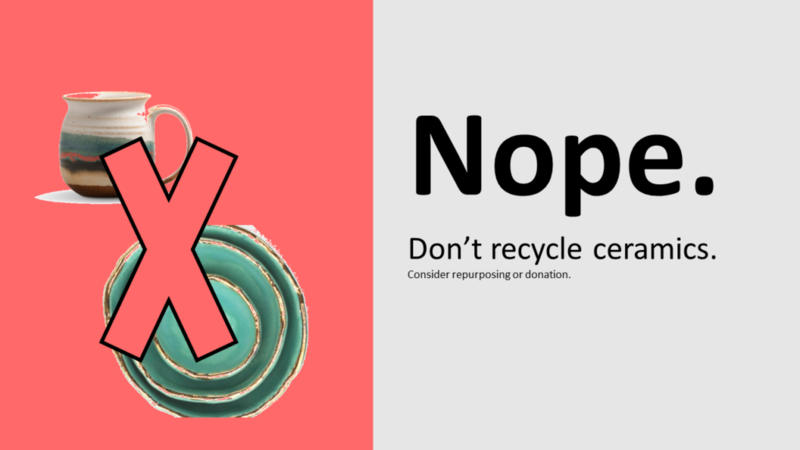 Any pottery, dishes or other household items made of ceramics aren’t recyclable. 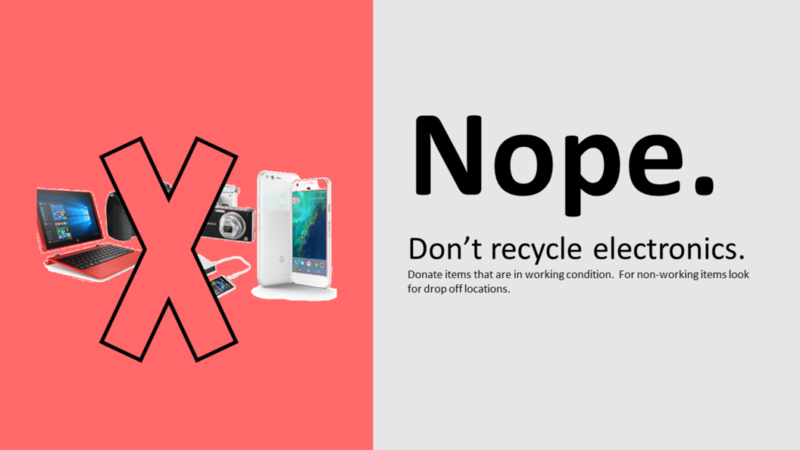 Either donate usable items to a place like Goodwill, or otherwise put them in the trash. Similar to batteries and electronics, light bulbs have special recycling streams. You need to take them to a special drop off location that accepts them. 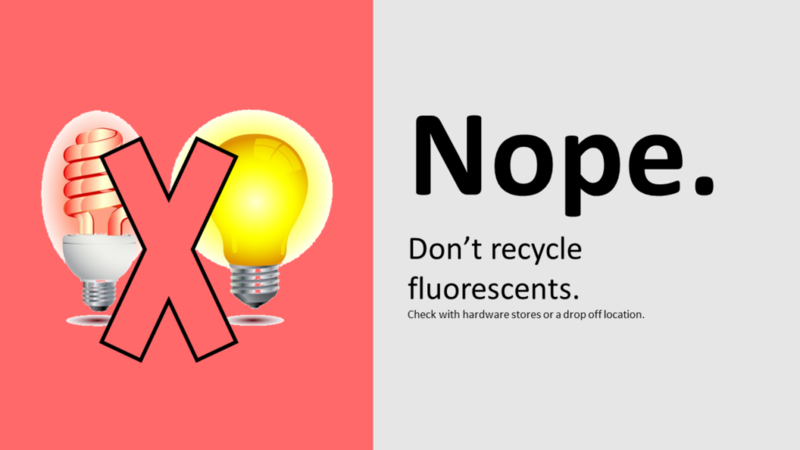 There are also stores like Batteries Plus Bulbs that collect certain light bulbs for recycling. Clothes just aren’t recyclable through curbside recycling, but there are special take back programs like H&M’s. Or, if the clothes are still in good shape, you should donate them. 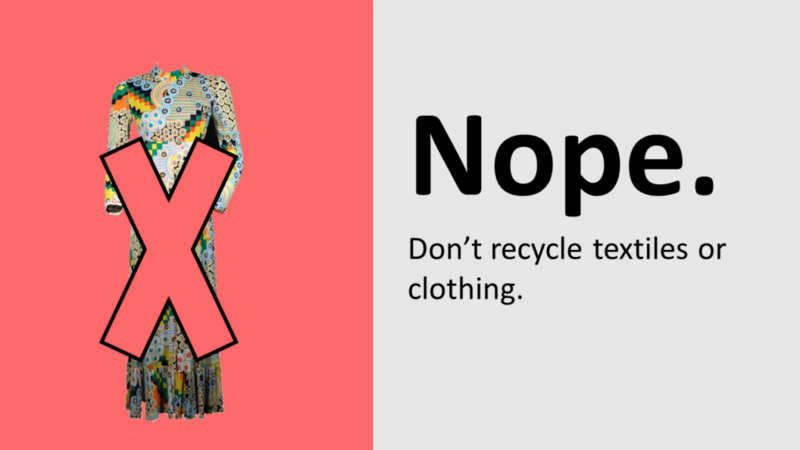 Keep textiles out of your recycling bin. 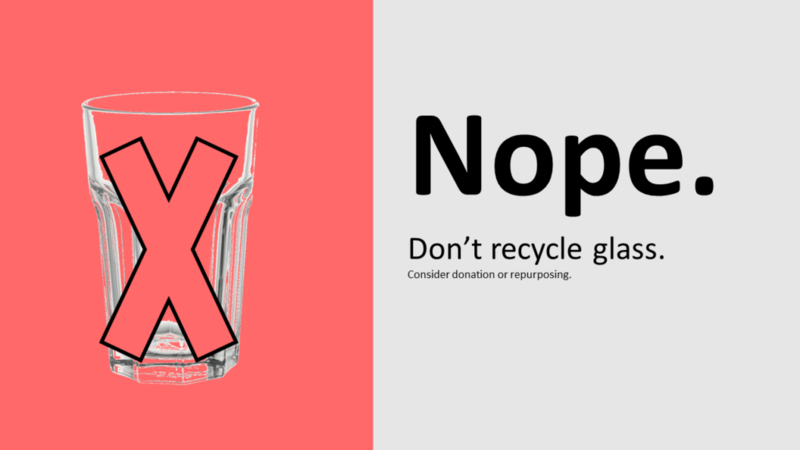 Do not recycle glass or glass panes. The glass that windows are made of is actually a different type of glass than the kind used in making packaging — it’s meant to be a lot more durable. Sometimes you will encounter wood in things like ice pop sticks, or much bigger pieces for protective packaging for furniture or appliances. 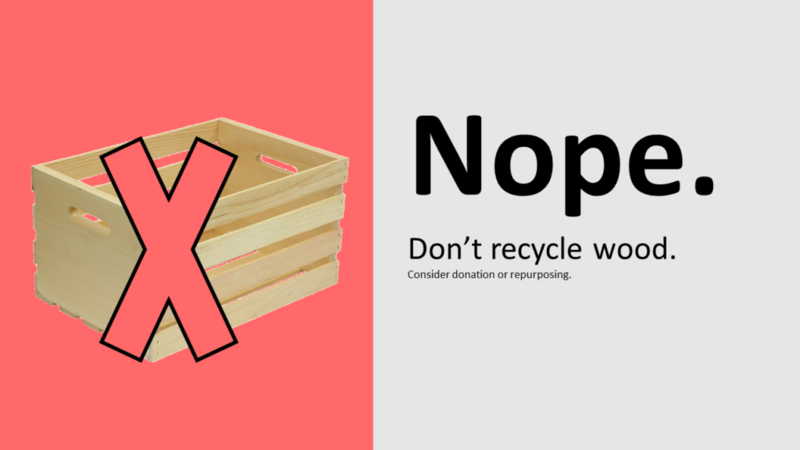 Wood is not recyclable. However, you could check to see if you have a composting program in your community. If you do, they may or may not accept wood items, depending on size and type of wood. container. 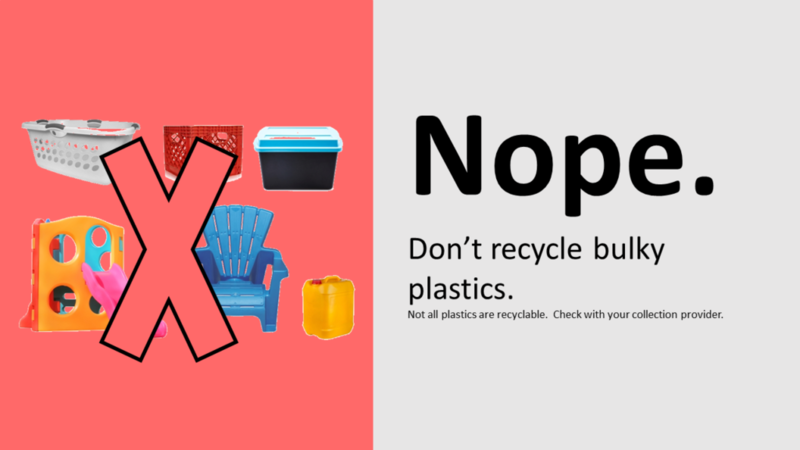 Unfortunately, the symbol does not mean that plastic container can be recycled. much easier and cheaper if the residents reuse these containers or dispose of them properly.